Posted by Keren Fite in Jewish Holidays, Passover, Slavery. 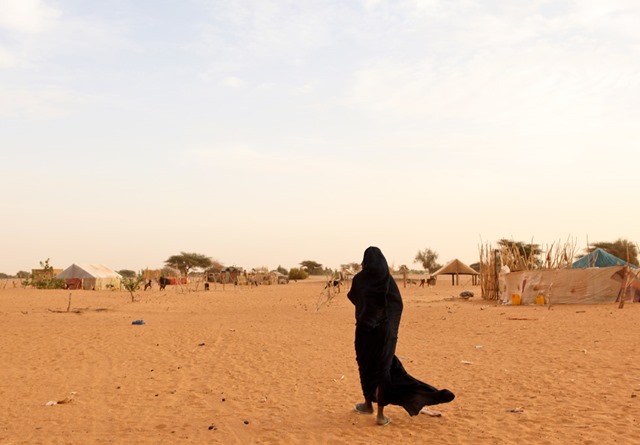 An estimated 20% of Mauritania’s 3.4 million people are enslaved for life. In 1981 Mauritania became the last country in the world to abolish slavery. However, the vast Saharan nation didn’t make slavery a crime until 2007. To this day, activists are arrested for fighting the practice. The government denies it exists. Only one slave owner has been successfully prosecuted. Moulkheir Mint Yarba returned from a day of tending her master’s goats out on the Sahara Desert to find something unimaginable: Her baby girl, barely old enough to crawl, had been left outdoors to die. The usually stoic mother — whose jet-black eyes and cardboard hands carry decades of sadness — wept when she saw her child’s lifeless face, eyes open and covered in ants, resting in the orange sands of the Mauritanian desert. The master who raped Moulkheir to produce the child wanted to punish his slave. He told her she would work faster without the child on her back. Trying to pull herself together, Moulkheir asked if she could take a break to give her daughter a proper burial. Her master’s reply: Get back to work. “Her soul is a dog’s soul,” she recalls him saying. Slaves in Mauritania are told that under Islam their paradise is bound to their master and that if they do what the master tells them, they will go to heaven. This is a powerful mechanism of control which teaches those who are enslaved to follow orders and accept their fate or they will be forsaken by God and live outside of Islam. Without access to education or alternative means of living, many believe that it is Allah’s wish for them to be slaves when in reality Islam dictates that a Muslim cannot enslave a fellow Muslim.